I’ve been playing Pokémon games for nearly 20 years now, and have loved almost every second of them. As exciting as all the changes I’ve seen have been over that time, some things have remained steadfastly the same. But, with the release of Pokémon Sun/Moon, many of those seemingly untouchable pillars of the Pokémon universe have been changed—resulting in the freshest game the series has seen since its early days, and possibly the best yet. Sun/Moon begins like many other games in the series. You wake up at home, and your mom tells you to go meet the local professor to begin what will surely turn out to be another fantastical Pokémon adventure. Unlike in others game, you’re the new kid on the block here, having just moved to the new region of Alola from Kanto (the region from the original Red/Blue Pokémon games). Breaking from what you may be used to from the franchise’s previous locations, Alola doesn’t have eight gyms for you to defeat. Instead, you’ll travel to four islands—each overseen by a Kahuna and their Captains who serve as gatekeepers to the powerful Guardian Pokémon on each island—and conquering them all is your primary challenge. 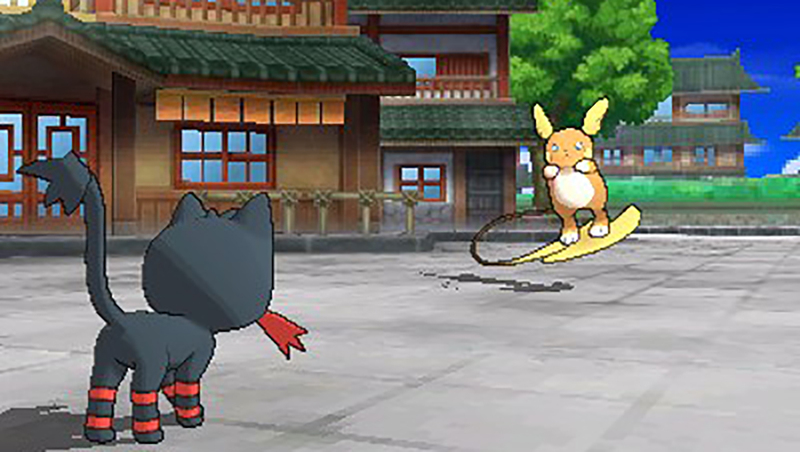 Because of your character’s roots in Kanto, Sun/Moon has a lot of callbacks to that original region—as well as other previous Pokémon games—with cameos galore from both characters and Pokémon alike. No other Pokémon game up to this point has been as self-aware of the universe in which the games take place, and it makes the region feel bigger than it is because of the influences from each previous game manifesting themselves in different ways. It also drips of nostalgia, giving long-time fans something to get excited about when they recognize obscure references, while potentially filling in the blanks for newcomers that want to learn more about those earlier generations. A perfect example might be the new nefarious group of Pokémon snatchers named Team Skull, who are more incompetent and comical than the original Team Rocket, but whose modus operandi falls alarmingly in line with the Kanto crooks and less with the world changing extremists of later titles. Alola may take some cues from previous games, but in many ways it has a dynamic all its own that might actually make it my new favorite region in the series. Part of that comes from the fact that Sun/Moon is again pushing the 3DS’ graphical boundaries. While X/Y offered the first polygonal graphics in a Pokémon game, there was still a lot of grid-based movement. Sun/Moon finally does away with this altogether (while also smoothing out some of those rough polygonal edges), giving your character the full 360-degrees of freedom to move around as you would in most modern games. Making most of the game incompatible with the 3DS’ stereoscopic 3D effect likely helped to boost the graphical power, and I, for one, did not miss it. The camera still remains out of the player’s control to help keep items and secrets hidden via perspective shifts, but this was a huge step forward to making the world of Pokémon feel even more alive and vibrant. There is also the aforementioned Kahunas and Captains, who give a shot in the arm to the old gym system. Instead of just battling your way to the top of each gym and then taking on the Elite Four, Sun/Moon offers up a wide variety of gameplay beyond battling. Each Captain will place you on a trial that involves battling at some point, but which also require you to solve some sort of puzzle, such as collecting the ingredients for a recipe or needing to pass a memory exam. Only then will you be able to take on their Guardian Pokémon in a fierce battle that will reward you with a Z-crystal—proof of you conquering the trial and your proficiency as a trainer, which also unlock more areas of Alola. 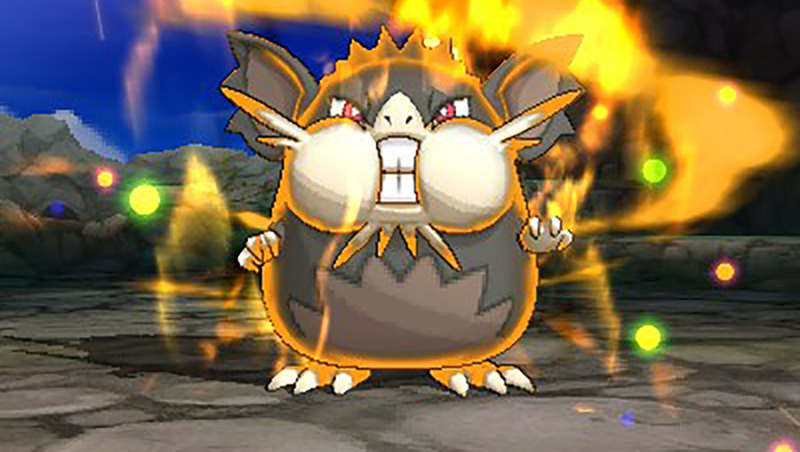 Once an island’s Guardians and Captains are behind you, you’ll then face the island Kahuna as you try to conquer the four corners of Alola. Speaking of Z-crystals, they’re just the first of several major changes to the battle system. Besides taking the place of traditional gym badges in how they prove your mettle as a trainer, they also unlock special moves for your Pokémon. While there are Z-crystals representing each of the 18 Pokémon types, there are also lesser ones meant for specific Pokémon like Pikachu, Snorlax, or the three new starter Pokémon. A Z-crystal move can only be used once per battle for your entire team, so choosing when and what Pokémon to use it for adds an extra level of strategy that goes far deeper than X/Y’s Mega Evolutions. My only wish now is that Pokémon could carry two items, because it sure is hard to take a Z-crystal away from a Pokémon unless you definitely know what you’re going up against in the next battle. Another major change in combat is how the UI now provides a chart showing stat changes (like if you’ve been hit with Growl and your Attack has fallen) and what moves are strong against what Pokémon. The stat changes are depicted via a series of arrows, which could be better if we were given actual number changes—but it definitely helps if it’s a back and forth bout. At first, I admit I was leery about the idea of the game just telling me what moves were effective and what ones weren’t, but I suppose it falls in more in line with what a Pokédex is supposed to do. With so many Pokémon and types changing from game to game, most people were probably heading to Google every few minutes to look up a Pokémon they were unfamiliar with anyway. My only issue with it is that it doesn’t go far enough. You need to capture or beat a Pokémon first before getting that information on your second encounter with it, whether in battle or in the wild. Why not just give people those stats from the start? Ash’s Pokédex in the cartoon gives him the information immediately upon seeing a new Pokémon. It could’ve, and should’ve, been the same here when Game Freak decided it was going make this change. One other major change in combat comes in the form of the removal of Hidden Machines. HMs used to have major traversal or world changing moves like Surf, Strength, and Cut in them. They would take up a normally useful move spot for a member of your team that you couldn’t change, or take up a spot on your team altogether with a Pokémon meant to just know everything useful. Sun/Moon does away with this, although some HMs are still present as normal move-teaching Technical Machines if you want to impart some of the more effective combat moves (like Fly). Instead, you get a pager and can call seven special Pokémon to help you make your way around Alola. For example, you can call a Taurus to break away rocks, or a Charizard to fly you to different Pokécenters. It’s a no-cost service, frees up space on your roster, and might be the most important change yet that Sun/Moon adds to the series. The ease of use was great, and the effectiveness of my party increased tremendously because of it. Besides the new island challenge and battling mechanics, there are plenty of side distractions to take part in as well. One new aspect is the Poké Refresh, which allows you to pet, feed, and play with your Pokémon outside of battle via the touch screen. A benefit to building up a good relationship with your Pokémon this way is it will offer unique bonuses in battle, but also is a free way of removing status effects on Pokémon. That means items like Awakening (cures sleep) and Antidote (cures poison) are only now necessary during battle—and that means less trips to the Pokécenter or Pokémart for medicines, and more time spent exploring the world and enjoying it. There are also new places to visit, like your own personal set of islands you discover called the Poké Pelago. Each island in the Pelago can house the extra Pokémon you’d normally keep in Boxes at Pokécenters, which you still use to change your lineup. Now, though, they can train to level up or gather items for you on the side, instead of collecting dust as just another statistic in your Pokédex. If you’re more about upgrading your trainer, another new feature called the Festival Plaza allows you to talk to people and earn special Festival Currency. This currency can then be used inside the festival to upgrade your trainer’s apparel and offers some much needed trainer customization to the game. Of course, I think it’d be easier if the game just let you customize your character fully from the get-go like every other RPG out there, but at least Pokémon is trying to get with the times when it comes to giving players a bit more expression on that front. 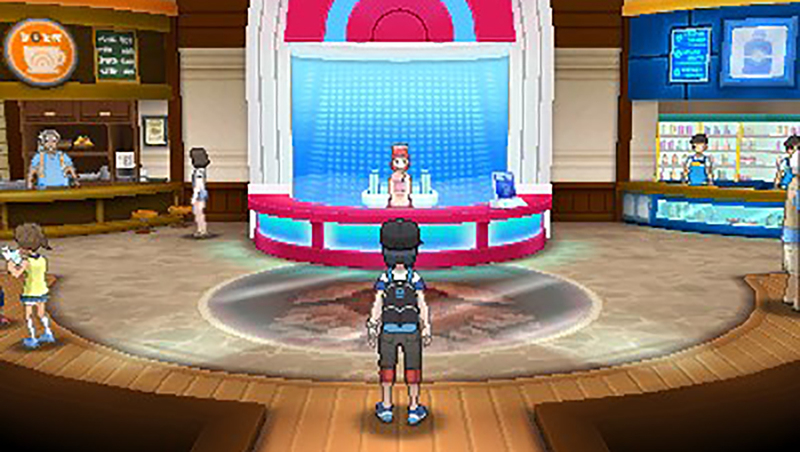 The Festival Plaza is also where you can trade with or battle players online, or use the new QR scanner via the 3DS’ camera to scan friends’ Pokémon to add their info to your Pokédex (minus the trading aspect). If you’re all about battling like I am, however, then I can attest that—at least in a pre-launch state—I was able to connect to a few folks online, and found there to be minimal issues in one-on-one situations. You can even record your battles and save them to your SD Card to watch and analyze battles later. Besides one-on-one battles, there’s also two-versus-two and the new Battle Royal matches, where four players put one Pokémon in and the last one standing wins. Unfortunately, it’s in these multi-Pokémon battles that some issues start to arise. Whether playing online, or even offline in the main game, whenever more than two Pokémon appear on screen (yours versus one other), the game starts to slow down a little, load times become more evident, and animation beings to crawl. These issues aren’t enough to ruin the experience, but they are enough to snap you out of your Pokémon reverie for sure—and it’s particularly shocking when this even happens against the computer in the main game. There’s also a new feature where wild Pokémon can call for help. Sometimes, a wild Pokémon that’s about to faint will call on another of its species, turning a one-on-one fight into a two-on-one (which also triggers the above mentioned slowdown). It offers you, the player, more experience for beating more Pokémon, but—especially if you’re trying to capture one of the two—it can prolong the fight considerably. I once got in a cycle where I had to face seven Zubats because I would take one out and the other would keep calling for help. Finally, I just gave up and ran away because no Zubat is worth that much time. So, this is one feature that I hope future iterations of the game do away with. 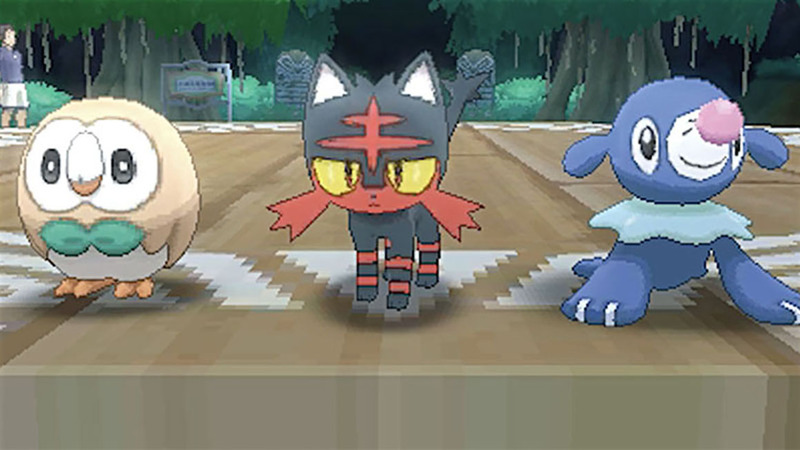 Another addition that was hit-or-miss is the new Alolan variants of Kanto Pokémon. For example, there’s now a dark-type Rattata (originally a normal-type), or an ice-type version of Sandshrew (originally a ground-type). For the most part, I like the idea of collecting different types of the same Pokémon, especially since only one is needed to unlock the Pokédex entry. What I don’t like about it is when those Pokémon are used in battle. When an enemy trainer is about to throw out a Pokémon, it only says “Ace Trainer is about to use Ninetails. Do you wish to switch Pokémon?” Normally, Ninetails is a fire-type, and I would counter with a water-type. The game never tells you what variant is being thrown out until it actually appears on your screen. If it’s the ice-type Ninetails, I basically wasted a turn needing to switch out my water-type for a fire-type. It’s a minor thing, but considering how serious some of us take our battles, wasting a turn isn’t something to be taken lightly. Pokémon Sun/Moon provides the series a shot in the arm we might not have realized it needed. Battling is more efficient than ever, and that cranks the fun up to levels we haven’t seen since the early days of the series—even with the occasional slowdown issue. New and old Pokémon come together to symbolize the balance this game has struck between Pokémon’s past and its future, providing nostalgia for us franchise veterans and some history for newcomers. Combine all this with more side content than ever before, as well as a beautiful 3D world, and Pokémon Sun/Moon is nothing short of an instant classic. The Good The island trials will make you never want to battle in a gym again. Ride Pokémon doing away with Hidden Machines from previous games. The Bad Some slowdown in battles involving three or more Pokémon. The Ugly Why is my character always smiling? Even when things take a turn for the worst in the game, my character’s facial animation never changes. Pokémon Sun/Moon are Nintendo 3DS exclusives. Primary version reviewed was Pokémon Sun. Review copies were provided by Nintendo for the benefit of this review. EGM reviews games on a scale of 1 to 10, with a 5.0 being average.